If I have a complex project with text overlays, many clips with transitions, and additional graphics and sound and I need to insert a clip somewhere in the middle, it is overly complicated to move everything after the insertion to make room. If you zoom out on a large project, it can be hard to target the exact start of the area to move, but if you stay zoomed in, the selection needs to scroll the work area to get everything. If there was a keybinding that selects the clips the playhead is over, in all tracks, and all the clips to the right of them as well, then such moves would become trivially easy. The 'T' command to cut tracks at the playhead, combined with this new feature, would allow you to insert footage anywhere, quickly and easily. The little red handle at the bottom of the "scrubber" does, I think, what you are looking for (see video for a quick example). You can even move it to where you want, zoom out on the time line, and then drag. Not shown in the video: you can drag it too far, add the media you want, then add an in point at the start of the gap (move scrubber and press I), then an outpoint at the end (move scrubber and press O), then ripple-delete (Command+Delete) to delete the space and close the gap. That's super close to what I was hoping for, though not perfect since it combines the select with a cut and a horizontal drag—sort of like a TV/VCR combo, you're stuck with both whether you want them or not. A keybind to just select the tracks at the scrubber and all further tracks to the end would allow for other possibilities, like shifting them up or down, deleting them, or applying a global audio change. And I probably won't want to cut the clips most of the time, since I have them overlapping the previous clips with transitions. 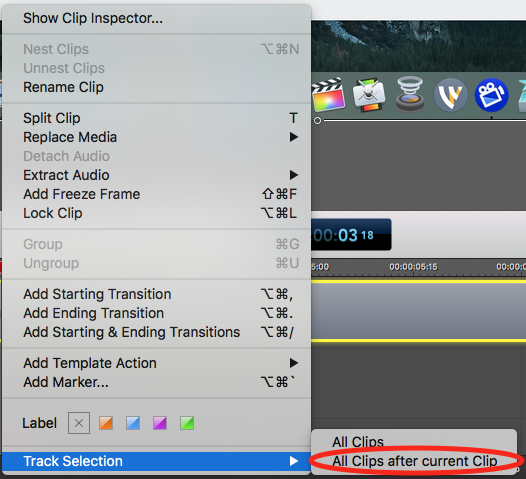 I'd want to slide them off and keep the overlap time to be used for further transitions after the new clips are inserted. So this feature is still something I think could be useful: "Select All After Scrubber" (and maybe a "Select All Before Scrubber" too, for parity's sake). I do like the bottom scrubber drag, though, and I plan to use it when I can (which won't be often because of the above issue) now that I know it exists. Is there a comprehensive list/tutorial/video that covers ALL such "hidden" features and shortcuts? Perhaps something like but for All Tracks? Got it. Thanks. Certainly make the feature request. You can link to this forum thread so the developers can understand the context. Michael Glasser Oh my Goodness, thank you!!! I'd had been searching the net, high and low trying to find an answer to this. You saved me! Jacqueline Kalab Happy it helped.